Let me tell you what happened in 1994. The third time is the charm. Jack Knight made an appearance in DC Comics' Zero Hour #1. Zero Hour counted backwards from issue four to issue zero. Following Zero Hour #0, was the DC line-wide event Zero Month. It was a chance for new readers to jump on-board each of the comics published in October 1994 with that individual book's Zero Issue. There were four DC titles that ended - or were cancelled - with Zero Hour; Team Titans, a spin-off of Teen Titans; L.E.G.I.O.N. '94; Valor (He used to go by the name Mon-El); and Justice League International. DC's Legion of Super-Heroes was re-launched with a Zero Issue and new #1, as well as a companion title Legionnaires. Seven titles were launched following Zero Hour; Extreme Justice; Fate; R.E.B.E.L.S. '94 (replacing L.E.G.I.O.N. ); Manhunter; Primal Force; Starman and Xenobrood (which was a limited series). Wanna know which one of those seven titles became the most enduring? Starman was re-launched a couple of times before 1994. In the '80's Paul Levitz and Steve Ditko created a Starman named Prince Gavyn. Prince Gavyn, Aquaman and Plastic Man were features of a Adventure Comics Dollar Comic. The feature didn't last very long and Price Gavyn was all but quickly forgotten. A few years later in 1988, Superman writer Roger Stern and Tom Lyle created another cosmic Starman, Will Payton. This Starman lasted awhile longer. He anchored his own title for 45 issues and was often in the company of Firestorm, Firehawk and Power Girl, Superman and Batman. He was courted unsuccessfully by Lady Quark, one of the characters from 1985's Crisis on Infinite Earths. He even fought David Knight, son of the original, Golden-Age Starman, Ted Knight. They fought for the Starman "birthright". When his title ended, Payton faded from the scene. In 1994, James Robinson, Tony Harris and Wade Von Grawbadger launched a new Starman. In the first issue, the Zero Issue, David Knight is patrolling Opal City. In his bright red and green costume he is standing perched on a rooftop. He is shot in the chest by The Mist's son Kyle. David falls to the pavement to his death. If the bullet to the heart didn't get him, the fall did. The Mist is Ted Knight's - the original, Golden-Age Starman's - mortal enemy. His Lex Luthor; his Joker. The Mist has returned to Opal to take his revenge on Ted. His son Kyle murders David; and tries to kill Ted's other son, Jack. Ted is injured when his observatory blows up and ends up in the hospital. Ted tells Jack to run away from Opal as far as he can get. Jack considers it, but then something happens. Even though he doesn't want to be a hero, he wants to run. He stays. He fights. He defends Opal, he avenges his brothers death and fights Kyle to the death and wins. Nash becomes his mortal enemy. Jack was the third time re-launching Starman in as many years. The third time was the charm. Why? Was it James Robinson? I have posted before and I will post again that I believe James Robinson and Roy Thomas are kindred spirits. Leaving Marvel for DC, Thomas left The Invaders and launched the All-Star Squadron grouping all of DC's wartime heroes in one book. Robinson wrote the four issue The Golden Age, a 1993 Elseworlds - alternate reality - four-issue mini-series covering much the same ground as Thomas. Robinson covered a lot of Golden Age ground with Starman, and during his run on Justice Society. I believe that Robinson, Harris, Von Grawbadger and editor, the late Archie Goodwin, had a lot to do with the success of Jack Knight as Starman. What I think they hit on, though, was the only way to do it right. Since the original Starman, Ted Knight, there were three attempts to make the character cosmic. There was even a Star Boy on the Legion of Super-Heroes. Ted Knight used his star rod technology and shared it with fellow hero Sylvester Pemberton, the Star Spangled Kid. The Kid later became Skyman, part of the next generation, Infinity, Inc. which featured the children and heirs of the Justice Society. Pemberton was killed in action toward the end of Infinity, Inc. before the title was cancelled ended. David Knight was portrayed as eager and zealous to take on his father's mantle. So much so that he died in action. The only way to make Starman work the way it did for Jack was to tie it back to Ted and Opal City. Everything that Robinson did was common sense. He brought the Golden Age back in Tales of Times Past stories that tied to storylines that he was setting up to a grand finale. Robinson made Starman about family. Jack's relationship with his father Ted. Robinson tied together all the Starmen into a legacy. Along with the Tales of Times Past stories, Robinson paused for annual Talking With David stories. Jack meets his late brother David annually, in different places. Jack and the surroundings are in black and white, while David, wearing the Starman uniform he died in is in vivid color. They first meet in a cemetery and do little more than make a mess they have to clean up after fighting. The following year, they meet onboard a pirate ship. Together they scuttle another ship before docking in Opal for a very special appointment. The next year, it's dinner with other dead heroes for advice on "the life". Later still, while searching for Will Payton with Mikaal Tomas - a one-time Starman from the '70's - it's Mikaal that talks with David, while Jack fights Solomon Grundy. Jack and David meet one final time, where all the pieces are finally fit into place. It is with this meeting that Jack and David travel back in time to 1951 for a very important job. I put the three-issue story arc about the Starman of 1951 in with the Talking With David issues because Jack and David are together through the entire adventure until it's conclusion. At the end of the adventure, David starts to feel cold, hear music and then, simply disappears - leaving Jack in 1951. He is returned to the present in a Legion Time Bubble by his successor Star Boy. And then Starman ends with #80. Jack Knight was Starman from October 1994 to August 2001. The issue that Jack's father Ted fights his ultimate, final battle against The Mist and ends like Sherlock Holmes and Professor Moriarty over Reichenbach Falls was released right around the time I lost my dad to prostate cancer. I held my dad's hand and told him it was okay. He'd fought the good fight. He could rest. My dad passed away on Mother's Day, 2000. I like to think it was a gift to my mom, since she had taken care of him the last few years of his life while he was fighting the cancer. I don't know if I would have felt any connection to any work other than Starman. The book had an interesting way of handling the death of characters. In 2010, when Geoff Johns brought the Green Lantern event Blackest Night across the DC line, a Black Lantern ring found David Knight and he rose again. Blackest Knight may have been DC's version of The Walking Dead, the Black Lantern Corps being corpses. Risen from the dead by their Black Rings and killing anyone in their path. Jack did not return to Talk With David this time around. James Robinson did return, though, and had The Shade defeat David's Blackened soul and write one final "The End" to Starman with #81. Because Starman's Talking With David was about brothers, and Starman itself was about family - fathers and sons - and community, it's one of the books I've brought along with on my trip to Kiev as I bring home my daughter with my wife. Creature comforts from home. 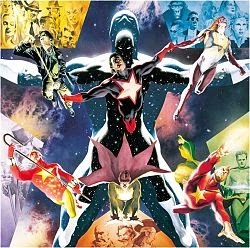 Starman issues #5, #19, #37, #49, #76 and #81.